1Heat/light up your barbeque and allow the flames to die down. 2Season the beef with pepper, but NO salt - salt draws out the juices and toughens the meat! (You can add salt if you need it at the end.). 3With damp hands - shape the minced beef into two patties/burgers. 4Cook the burgers to your liking - remember to place your blue cheese on top of the burgers to melt just before serving; then toast the burger buns or French bread. 5Assemble your burger like so: bottom bun: lettuce, tomatoes, Bearnaise sauce and burger with melted blue cheese. Spread the Dijon mustard on the top bun, then place the onions and cornichons on top of the burger, with an extra dollop of Bearnaise sauce if you wish - then add the top bun. 6If making these for a crowd - have all the condiments and salad ingredients handy and on a platter - and people can help themselves, as soon as the burgers are cooked. 7You could fry your onion - but I like the taste of raw red onion in these burgers! Put onions, vinegar, tarragon and pepper in a sauce pan and bring to a boil. Reduce to about 1-2 teaspoons of liquid. Stir constantly. Remove from stove and let cool. Put egg yolks and cooled mixture in a blender. 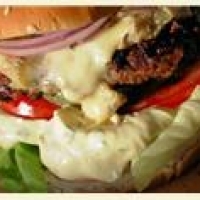 Wonderful, You should enter the build a better burger contest at Sutter Home. 50k prize!! This would be a winner for sure. Sounds wonderful. A gourmet burger.